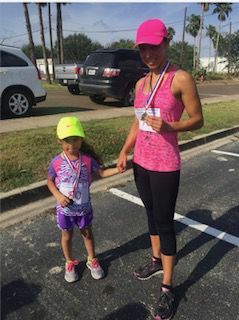 Fany Pinales poses with her daughter in this undated photo after a run with her daughter. Undergoing moments of stress and personal strife can manifest as physical and emotional pain throughout the body. For one Brownsville resident, the act of running helped alleviate stress and amplified her personal wellbeing. Four years later, the 44-year-old has already participated in the Brazos Bend ULTRA 50-mile marathon and trail, and received qualifying time to participate in the 2018 Boston Marathon during the 2016 McAllen Marathon. QUESTION: Where some of your favorite places to run in the RGV? ANSWER: One of my favorite places to run is the Resaca de La Palma State Park (in Brownsville). I get the best of both worlds as a runner — I can do some miles on the asphalt trail and some miles on the dirt trails, plus I get to take in nature … the brush, the trees, the ponds, the birds, etc. Q: What goes through your mind in deciding which marathons to sign up for? A: The marathon course is definitely what drives me to sign up for a marathon. I signed up for Big Sur Marathon in Monterrey, California, just because of the scenic views! I’m sure the steep hills and the terrain will bring some challenges but all I think about right now is experiencing a long run along the Pacific Coast! I am super excited about this one! Q: How do you motivate yourself to train? A: My motivation comes from wanting to do better than the last race. I have a schedule with my fitness activities which includes Zumba, strength training, some runs for speed work and some long runs for endurance. Q: What does your family think about your running? A: My husband and my children are very supportive of my running! I do it for them! I want them to see that it’s never too late in life to try and do something new! I was never a runner in school and now I am! Q: What’s the best running tip you’ve ever received? A: The best tip has been “pace yourself” from my dearest friend, mentor and running coach, Sheralee Six. I used to have the horrible habit of taking off too fast and then burning out towards the end of the race! This tip has changed the game for me! I enjoy my runs much more now that I’ve learned to pace myself! Q: Can you describe some of the medals you’ve received? A: I have medals for all of the Brownsville Historic Half Marathons, two for the Harlingen Get UP and Train Half Marathons, McAllen Relay Marathon, South Padre Island Marathon and several for the Longest Causeway Run 10K, La Feria 5K, Show the Trail Who’s Boss half-marathon, USA Heroes Tribute Night Trail Run, Color Run, Ocelot Run and Brazos Bend Ultra. Q: What advice would you have for new runners? A: Anyone wanting to take on running needs to incorporate strength training! When I first started running, I was logging 25-30 miles a week and doing other cardio. I was injured most of the time. I incorporated strength training two years ago, and I feel much healthier and stronger as a runner. Q: What benefits do you see from running, both physically and emotionally? A: Well, there is a lot of research that shows that running makes your heart stronger and improves your overall cardiovascular fitness. Emotionally, it’s an opportunity or time to clear your mind.